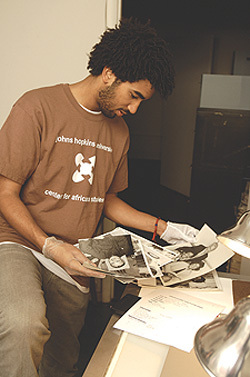 Mark Mehlinger, a Johns Hopkins senior, is one of five students from three area colleges who are sifting through photos and clippings in 'The Afro' archives. Since 1892, The Afro-American Newspaper has been a publication of record for Baltimore's African-American community. The longest-running periodical of its kind in the United States, the family-owned newspaper covers both national and international news from an African-American perspective. Currently, most of the publication's archival collection, which includes older print editions and thousands of photographs, resides in stacks of boxes in the "morgue" of its Baltimore headquarters, located at 2519 N. Charles St.
How vast is the archive's historical wealth? A Johns Hopkins-led effort wants to determine just that. In order to preserve the newspaper's archival holdings and make them accessible to the masses, the Center for Africana Studies and the Sheridan Libraries' Center for Educational Resources have embarked on the Diaspora Pathways Archival Access Project, a student internship program funded by a three-year grant from the Andrew W. Mellon Foundation. The program is one facet of the Center for Africana Studies' larger Diaspora Pathways Initiative, which also includes oral history projects and academic courses, such as one on African-American/immigrant relations that ran last year. In November, the program selected five students from Johns Hopkins, Goucher College and Morgan State University as its initial cohort to uncover and describe the contents of the paper's archives. Their work began in January. The objectives of the project are to identify important unprocessed collections at the newspaper, inventory and organize the collection, and ultimately create an online database for searching the material. To accomplish the work, the students make regular visits to the newspaper to sort through boxes — organized by letter — that contain thousands of folders filled with clippings, photographs and manuscript materials that date back to the paper's founding. The students organize the material and also conduct conservation efforts, such as taking digital photographs, and providing basic descriptions, of each item and its location. In their first week, the interns found such treasures as photographs of civil rights activist Daisy Bates, a photograph of Sudanese political leader El Ferik Ibrahim Abboud walking with President John F. Kennedy, and thousands of clippings chronicling the everyday lives of black Baltimoreans through announcements of births, deaths, weddings and graduations. The students work under the supervision of Marilyn Benaderet, the newspaper's archivist; Debra Newman Ham, an archival expert at Morgan State University; and Moira Hinderer, a postdoctoral fellow at the Center for Educational Resources and the Center for Africana Studies. Hinderer, project manager, said that the newspaper's collection, which is in remarkably good condition, is both extensive and historically significant. She said it's particularly rich in images and stories that chronicle the civil rights movement. The Afro-American Newspaper was founded by former slave John H. Murphy Sr. after merging his church publication, The Sunday School Helper, with two other church publications, The Ledger and The Afro-American. Candice Dalrymple, director of the Center for Educational Resources and an early champion of the initiative, said that she was looking to identify a repository in Baltimore that needed preservation, particularly one that involved African-American history. In 2006, Dalrymple approached Ben Vinson, director of the Center for Africana Studies, and the two collaborated to find a collection with which to work. They found it just down the street at The Afro-American. The two later applied for the Mellon grant. "The opportunity for Hopkins to partner with a major Baltimore City institution like The Afro-American Newspapers and colleagues at Morgan State University to uncover and describe nationally significant historical records is perfectly aligned with the objectives of our university since its founding," said Dalrymple, associate dean of university libraries. Johns Hopkins received inquiries from undergraduate and graduate students from 10 institutions to participate in the internship program. "Clearly, young scholars are eager to acquire the skills to uncover, analyze and describe the contents of these archives," she said. "Imagine the thrill of uncovering original transcripts of the 1950s McCarthy hearings questioning Langston Hughes, who was an Afro reporter at the time, or uncovering Baltimore photos of Daisy Bates, the civil rights activist and journalist, who advised the Little Rock Nine through the Little Rock integration crisis. There really is a visceral reaction to touching and describing historical records of this magnitude." Vinson said the project enables the Center for Africana Studies to partner with a community treasure to arrive at new ways of looking at the African-American past. He said the students will undoubtedly uncover vital documents and images, many never before seen by the public, for both layperson and scholarly consumption. In the future, he envisions a course or two focused on The Afro archives. "The newspaper's collection is an invaluable recording of the past that has slipped from view," he said. "We are going to bring it to light." GO TO MARCH 17, 2008 TABLE OF CONTENTS.